Toggl Timer is a native app for iOS designed to help you track time while on the move. It will sync instantly with your Toggl account allowing you to seamlessly switch between tracking on the phone and tracking on the web or desktop. After logging in you will see the default/main screen of the app - the Timer screen. From here you can initiate actions such as starting a time entry, stopping a time entry, etc. The image below matches each icon with its function. The time entry log - chronological list of your time entries. Tapping an entry will open the Edit screen and allow you to modify it. This screen is opened after starting a new time entry by clicking on the green play button on the Timer page. The image above outlines exactly what each button within the page does. When you're finished making changes tap the green checkmark in the bottom right corner to save them. Alternatively, tap the small X icon in the top left corner to discard the changes. 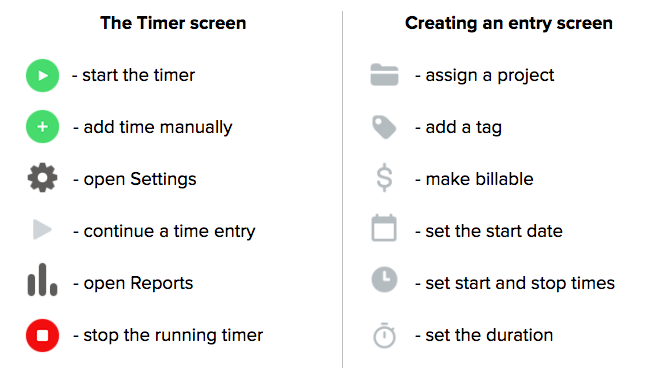 This lets you set an Entry’s start time, stop time, and duration. Each turn around the wheel represents an hour. Hold and spin the gray play icon around the wheel to set the start time. Spin clockwise to move it into the future, or counter-clockwise to make it earlier. You can do the same with the gray stop icon to change the stop time. Hold and spin the gray area between the play and stop icons to change the start and stop at the same time. This lets you keep the Entry’s current duration constant. Tap the middle of the wheel to type in the duration. Use the format hh:mm (for example, 1:30 is one hour and 30 minutes). The start and stop times above The Wheel change as you spin items around. Tap the < icon to the upper-left of The Wheel to discard your changes and go back. Tap Save to the upper-right of The Wheel to save your changes. Open Reports by tapping the bar icon from the Timer screen (middle icon at the very bottom of the screen). 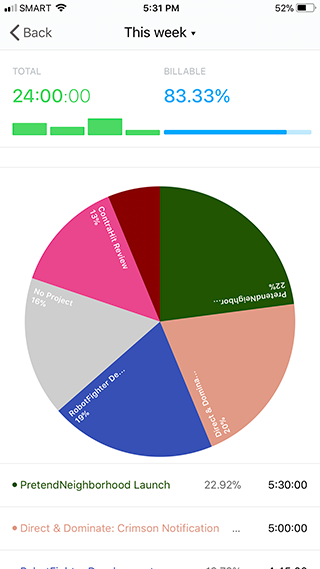 Reports on mobile still let you see a breakdown of your tracked Projects over a specific period. Please note that mobile reports are limited to your own personal time. For full workspace reports please log in to the web app. The Toggl app allows you to use Siri for actions such as starting or stopping the timer. In other words, you can interact with the app without actually opening it. Perform a few actions in the Toggl app (e.g. starting the timer, stopping the timer, etc). Navigate to iOS Settings >> Toggl >> Siri & Search >> Shortcuts. Tap the + icon next to the shortcut you want to create. Record the audio trigger for the action. If you're creating a shortcut for starting the timer, the audio cue can be "Start Toggl". Activate Siri and say the audio trigger defined earlier. Note: It's normal for the action to take a few seconds to execute. The calendar view allows you to see calendar event happening today. Those events can then be easily turned into time entries. Access the Calendar screen by tapping the calendar icon (bottom right corner) while on the Timer screen. The app will prompt you to connect a calendar when you first open the Calendar view. If you decide to connect another calendar in the future just tap the Settings icon in the top right corner. Note: Switching between days isn't possible in Calendar view. You can only create & edit entries for today. I'm only seeing calendar settings, how do I open regular settings? Go to the Timer screen and then tap on the settings icon. When in the Calendar view, the settings icon displays calendar settings. Everywhere else, it opens the regular settings.